Bedtime can be crazy or calm depending on the day, the kids, and the activities that you do leading right up to it! Getting kids to sleep and stay asleep hasn't always been easy at our house, so we're always on the look out for ways to make bedtime more successful. Nightly pillow talk that we shared about here is one of our favorite activities after the kids are in bed. On days that we are racing the clock and busy with activities right up until 7 or 7:30pm I notice that our 8pm bedtime is a little more chaotic and sometimes an all out war zone. 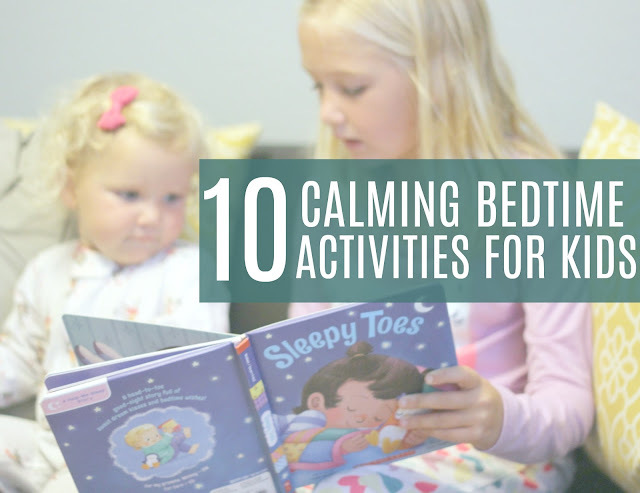 On the nights where we have ample time to be home and do some calming activities I find that bedtime goes much more smoothly! It took me awhile to find some calming activity ideas that worked for us. Each child is different in what works to calm them down. If you have additional ideas that work for your family, I'd love to hear about them! Here are 10 calming bedtime activities to try with your kids! This is my favorite activity and probably your favorite as well. Books are powerful tools for connection and calm. Sleepy Toes by Kelly McNeil is currently a favorite bedtime book at our house. The pictures are adorable and there are a lot of animals in the book (puppies and kitties) so my toddler is in heaven when we read it. She also loves talking about her toes, nose, fingers, etc. The School Library Journal says that ""Caregivers everywhere will want to have this book in their bedtime arsenal" and Sleepy Toes is the #1 seller on Amazon's books for children and the body and makes a wonderful addition to any bedtime routine. We love it! 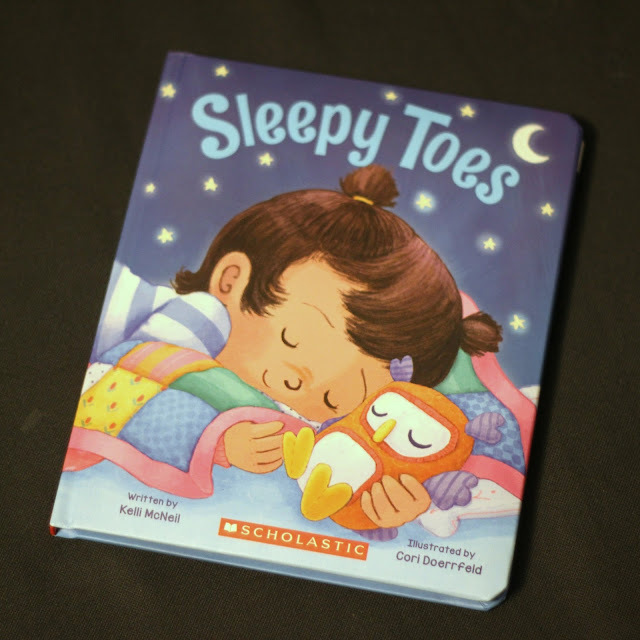 Make sure you scroll down to the end of this post to enter to win your own Sleepy Toes book! Puzzles keep your hands busy while allowing your mind to relax. I've even read (here) that puzzles can enhance your mood, lower your heart rate and blood pressure, and allow us to release stress and relax! At the end of the day we could all benefit from that sort of thing! 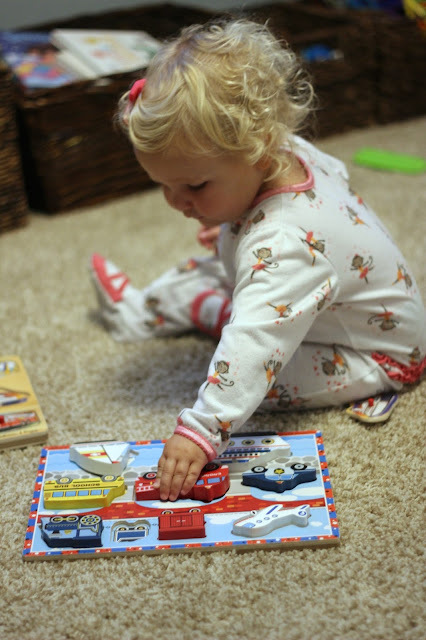 My toddler loves our Melissa & Doug puzzles! Our favorites right now are jumbo knob puzzles and the vehicle puzzles. 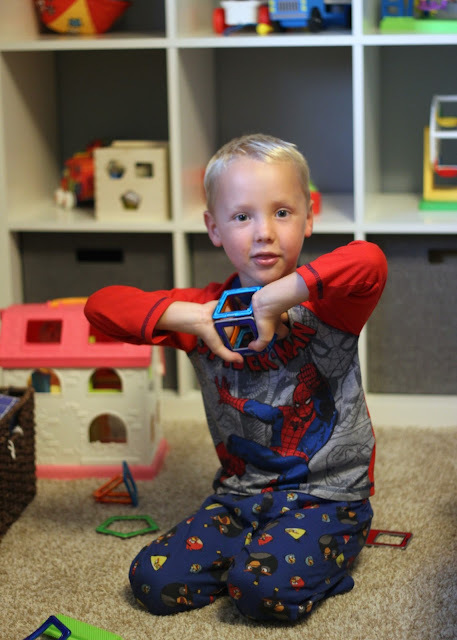 We love building with Magformers, wooden blocks, and even our jumbo cardboard blocks before bed. Working together, chatting about our day, and sharing ideas really allows for some fun while also time to talk through any problems or successes in the day. 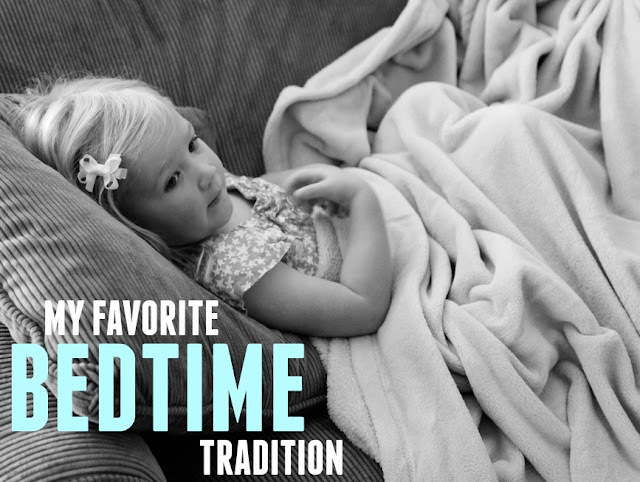 We shared more about this bedtime in an earlier post, but kids love to talk about their day. Having a set time to do that each day can alleviate any anxiety at bedtime as kids try and get in their last few stories or things they want to tell you. My kids crave this time with us and I love it too! 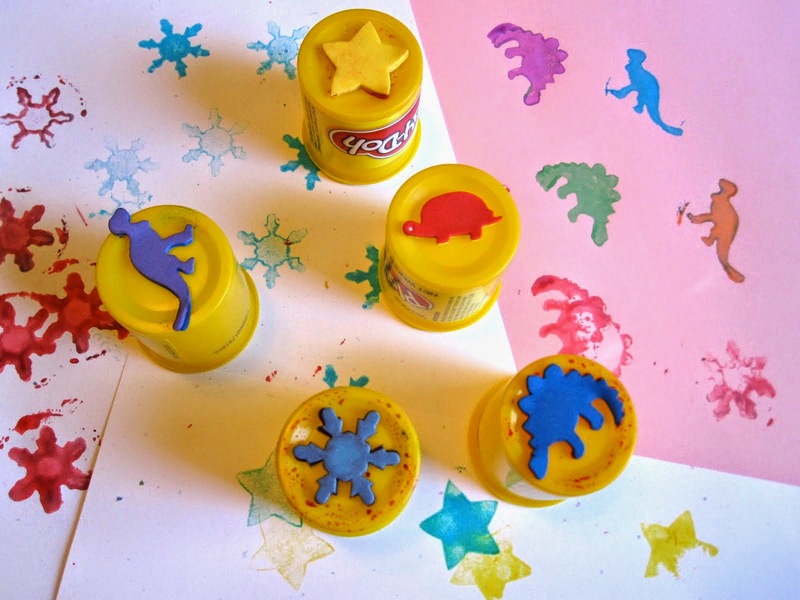 Simple craft activities like stamping and coloring can help your brain calm down while you think about your day. We have several sets of stamps that are fun to pull out when we need to calm down and the kids love creating things on large pieces of easel paper. We've even made our own stamps before to use! Sensory activities like playing with playdough are great at bedtime too! Add some lavendar into your playdough and that can be awesome! Our favorite homemade playdough recipe is from The Imagination Tree. Other sensory activities can include swinging or rocking if you have a swing or rocking chair or larging bouncing ball. Also playing with a balloon filled with rice or stress balls or other fidget objects can be helpful to some kids. Sensory bins like rice or bean sensory bins or even sand can be awesome too! Water play has an automatic calming effect for us! Everyone is happier when they are in the bath and playing with toys and enjoying the sudsy warm water. My problem is usually getting kids OUT of the bath because it is so relaxing! 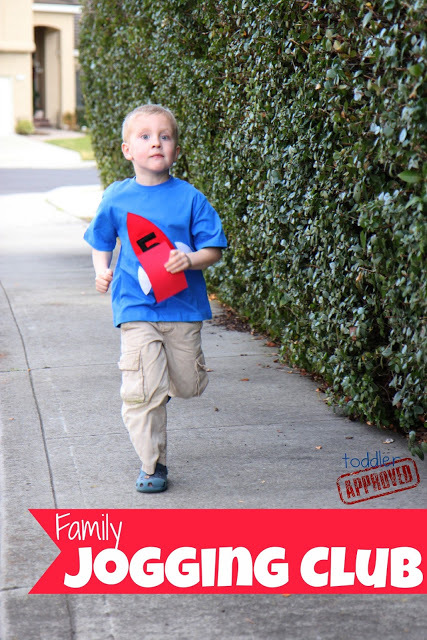 Our family jogging club is a great activity to do before bedtime for some kids who need something active to do to help them calm down. Some kids get more wound up and energetic with exercise, so you need to know your own kids and what works for them. Board games require a lot of concentration and totally calm me down at the end of a long day. My kids love Sorry and Sneaky Snacky Squirrel along with Candyland, Operation, Zingo, Memory, and Spot-It! Alright! Now that we've shared OUR FAVORITE calming bedtime activities, tell us yours! We're happy to giveaway one copy of Sleepy Toes by Kelly McNeil to one Toddler Approved reader. We hope you'll love reading this book at bedtime as much as we have! Giveaway: Enter using the Raffelcopter form below. This giveaway runs from September 21st until 12:00am on September 27th. Disclosure: Kelli sent us two copies of Sleepy Toes for free to review and one to giveaway to a reader! We love bathtime followed by reading! These are some great ideas--we usually do bath, book, and some milk! I love reading books with our daughter at bedtime. We talk about our day at dinner and then relax with books. As she gets older I would love to add in pillow talk and lullaby stories while snuggling. My daughter has sensory issues and we have definite bedtime problems! Our favorite is reading, and also deep pressure massage on her arms and legs.